In the very near future, the powerful Gowa family has become Japan's top-secret developer of bipedal weapons platforms, which they call Tactical Armors (TAs for short). Yushiro Gowa, the fourth of five children and youngest son, has become the Gowas' chief test pilot because of his uncanny ability to actually improve the performance of his and other TAs through his piloting. He also dances the Dance of Gasara (a traditional Noh dance) for his older brothers and father in a long-time, long-forgotten clan effort to once again summon the god Gasaraki. As he does so, though, Yushiro becomes aware of another like him: a green-haired girl who is a similar type of test subject, and one who can also do the summoning. He finally meets Miharu in the Middle Eastern country of Belgistan, where his experimental JSSDF unit is deployed when a U.N. invasion predicated on seizing weapons of mass destruction stalls out on the ground due to unexpectedly heavy resistance. That resistance was made possible by Symbol, a secretive multinational megacorporation, which supplied Belgistan with its own version of TAs, called Fakes, as a kind of field test, and Miharu is their ace. In the midst of the world's first mecha-on-mecha battles Yushiro and Miharu struggle to be together and understand both what it means to be “kai” and the full meaning of Miharu's warning about not summoning “the terror” back to the world. Belgistan is but one piece of the larger picture, though, as Symbol and the Gowas are not the only forces moving to reshape the world on both national and international levels. This 25-episode 1998 production by Sunrise was originally licensed and dubbed by ADV Films and released on both DVD and VHS singles from late 2000 through early 2002, with a Complete Collection on DVD following later in 2002, but it apparently never had enduring enough popularity to remain in circulation over the next decade. Nozomi Entertainment's licensing of it in the summer of 2011 was the first action take on it in many years, and now, nearly 9½ years after its last American release, it is once again back in circulation in a new, more compact Complete Collection But will the current generation of anime fans appreciate it? As mecha series go, Gasaraki is an aberrant branch in the tree of titles which sprouts off of Neon Genesis Evangelion. 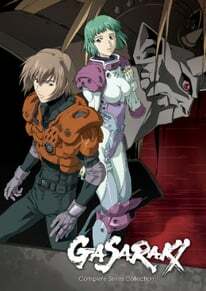 It is certainly one of the most sophisticated of all mecha titles, with a dense, uniformly serious plot which delves as heavily into geopolitical issues, philosophizing about nationalism, the complexities of world commodities markets, and immigration issues as it does into the intricacies of mecha development and operation. It uses traditional Noh dances as a means to insert mysticism into what is otherwise a story and setting heavily ground in realism and tries to spin a love story about two individuals who must fight against fate over the course of more than a thousand years to be together; it even devotes two episodes to events that happened back during the Heian Era to lay the groundwork for modern events. Though the plot moves along slowly, it only feels like it is dragging when it resorts to full-blown philosophical discussions in its final quarter and only its romantic component truly falls short. The series' biggest draw, though, is the meticulous detail it puts into its animation and depiction of mecha activities. Few other mecha titles even come close to matching this series' degree of realism and technical detail in the preparations, piloting, and missions involved with mecha operation. Here mecha synchronize laser targeting with each other, employ flying drones for data collection and coordination, use built-in winches and hydraulic pistons to hoist themselves up buildings, get dropped from planes while sitting in protective sleds, and react with appropriate difficulty in environmental hazards like storm-blown sand. The boxy mecha fit their pilots very snugly into claustrophobic cockpits and rigorously follow the laws of physics in their movements. Support personnel guide pilots' actions down to the second and meter and adjust fine operational details from minute to minute. The attention to realism carries over into other aspects of the show, too, such as the nature of the media coverage, the fact that most of the mecha pilots are adults (Yushiro, at 17, is the youngest), and the sensible reactions by military units and security forces to threats. If all of this sounds rather dull, it isn't. For all of the series' emphasis on minute detail, it also regularly delivers an amazing level of intensity. Director and co-creator Ryosuke Takahashi, who was also the creative mind behind the earlier Armored Trooper Votoms titles and the later Blue Gender and Flag, clearly knows well how to stage both mecha and non-mecha action and exploits all of his expertise here. The plotting and pacing are also free of fat, with barely a wasted scene (thought a few may try viewers' patience!) as they play out the multi-tiered story. Frequent use of news program clips also provides a slick way to deliver setting details without resorting to straight exposition. The series does have some problems, however, and they are not easily ignorable ones. Yushiro may be the main protagonist, but he has all of the personality of wet cardboard and is only slightly more interesting to watch. Miharu, in a virtual supporting role, isn't much better and spends a significant swath of episodes through the series' middle catatonic. The love story between Yushiro and Miharu is similarly limp, with little real depth of feeling ever developing between the two. They are more players in the story than carriers of it, however, so the better characterizations and more dynamic interactions in the broad supporting cast balance them out. Not balanced out is the overemphasis on Japanese nationalism and the character of the Japanese people on display in the final few episodes; someone clearly fell in too much in love with rhetoric here, resulting in several scenes where characters just sit or stand and talk about what it means to be Japanese. Coupled with this is a very negative look at both Asian immigrants and the United States which, in the latter case, may not set well with some American viewers. A mostly anticlimactic and unsatisfying final episode, which will remind many viewers of NGE, is an additional strike against, although the events leading up to it are much more satisfying. Sunrise's artistry excels in its mecha animation and technical detail, with CG effects primarily limited to computer displays. It also does a great job of giving its broad cast of characters distinctive looks without giving them outlandish appearances, including giving certain characters (generally the most nationalistic ones) specifically Japanese looks. Consistent quality control is a problem whenever mecha or other technical gear isn't on the screen, however, and the high-resolution TVs available now that did not exist when the series last circulated bring out the roughness and flaws all the more prominently. they also brings out how flat and subdued the series' color scheme was; the brand-new front cover art is far sharper-looking than anything in the series. The series also takes its share of animation shortcuts, though it is careful to pay exacting attention to important details like the Noh dances and mecha maneuverability. The artistry mutes its graphic content sufficiently to keep it at a 13+ age reading and has only a couple of brief snippets which could constitute fan service. The musical score is at its most effective and balanced during the mecha battles and Noh dances, with results varying elsewhere. It so overplays the dramatic sound on the announcements that certain characters are “kai” that the scenes become laughable, and only partly succeeds on making something out of nothing in a couple of scenes that are supposed to be horrifying. Opener “Message #9” is a dramatic but uneven song paired with unremarkable visuals which regularly update, but closer “Love Story,” also sung by Tomoko Tane, is another matter. Its haunting melody, filled with longing and passion and paired with elegant, symbolic animation, make it one of the all-time-great anime closers. For this release Nozomi has spread the 25 episodes evenly across five disks, with the only Extras being clean opener and closer and some boring Japanese “behind the scenes” clips on the fifth disk. Lost are all of the glossary and terms files, additional Japanese “behind the scenes” clips, and ADV's own “behind the scenes” clips that were available on the original single releases and involved the dubbing process. Also lost are the disk liners included with each of the original disks, which mostly consisted of character bios and equipment details but also included a map of the Gowa estate. Nozomi has also altered some of the subtitling and on-screen text translations with an eye to retaining the original Japanese writing, though this is not always beneficial; for instance, in the scene at the beginning of each episode where a poem types out on a computer screen, the original release replaced the Japanese text with an English translation which types out as the Japanese text does, but now the original Japanese text types out while an English translation – in white font against a white background, mind you – appears intact below it. The original Japanese credits are back, with the English translation only in a separate credit roll at the very end of each episode. Unless one is picky about having credits in the original Japanese or is looking to conserve shelf space, those who own one of the two previous releases of the franchise are unlikely to find anything of value here. This is more a release for those who have never owned and/or experienced the series before. For those who haven't, this one is highly worth checking out if mecha content that emphasizes realism and technical detail more than cool factor sounds like your kind of thing. + Virtually unrivaled mecha technical detail, involved plotting, all-time-great closer. − Weak final episode, uninteresting leads, philosophizing gets rather thick in the late stages.